We sought out the services of Deckmaster Fine Decks because we wanted to use the Deckmaster hidden fastener system. We wanted a builder who could construct a deck, stairs and a bench so that it would look like finely crafted furniture. We also wanted to use synthetic decking. Weston and his team at Deckmaster came through with a fine carpentry look with almost no visible screws. Corners and trim are finely mitered. The deck is seamlessly on level with an adjacent tile patio. Deckmaster expertise with the hidden faster system as well as synthetic decking has provided us with a beautiful, low maintenance and very strong deck. 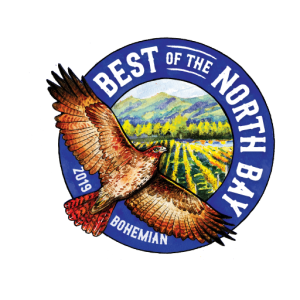 Deckmaster is fully licensed, bonded and insured. The contract paperwork for the job is handled in a most professional manner. A four year warranty on workmanship is provided. It was a surprise to discover that Deckmaster builds fabulous fences! We had hired Deckmaster to construct a deck for us, but we also wanted a fence. The desired fence required the construction of a picket and cutout pattern. It also had to stand up under a considerable wind load as we live in an area that can get high winds. Weston Leavens at Deckmaster worked with us to design a robust anchoring system for the fence pickets and cross stringers. He also was careful to choose stainless steel screws so that the fence would not streak with screw corrosion. He was meticulous about his selection of wood. 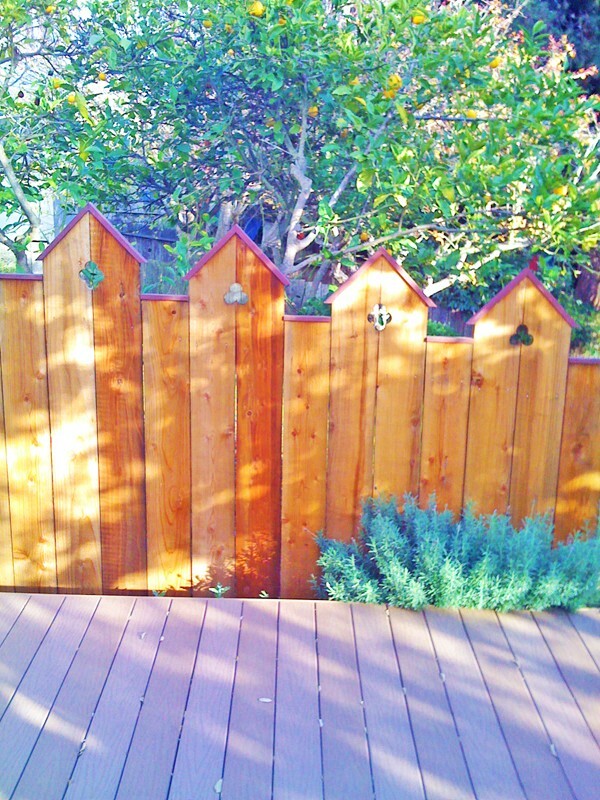 Many builders would not weed out poorly cut fence boards, but Weston did. Weston also was careful to construct the fence along a grade in our back yard so that the top of the fence pickets are at a steady angle. The effect is very pleasing to the eye. 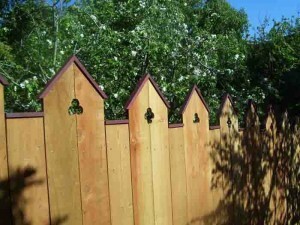 The fence reflects the attention to detail and craftsmanship that Deckmaster is able to provide. It has helped to transform our back yard into a fairytale like space.